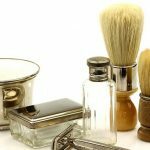 For professional male groomers, Simpson is synonymous with great shaving brushes. Founded in 1919 by Alexander Simpson, this London-based company continues to handcraft every single one of its award-winning Badger brushes. 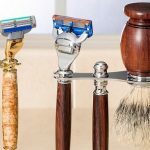 As you could imagine, Simpson shaving brushes aren’t cheap. Some of the newer models can cost you well over $300. 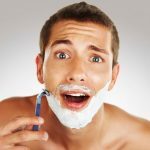 Although Simpson shaving brushes are an investment, many professional shavers say it’s the best money they’ve ever spent. If you’re considering purchasing your first Simpson, take a look at this list. 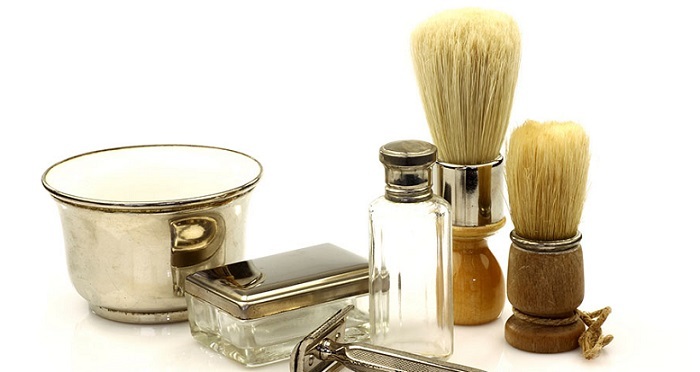 Below, we’ll go over six of the most popular Simpson shaving brushes now on the market. This list goes from the least expensive brush to most expensive one. As you could tell from the name, the Special S1 Best Badger Shave Brush measures 90mm in height. 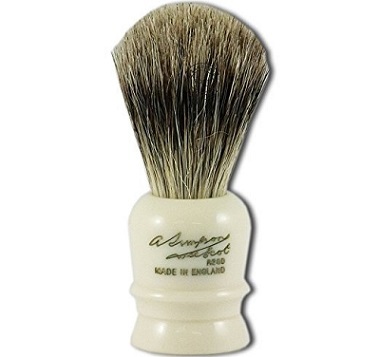 Simpson chose to use Best Badger fur on this brush, and the bristle loft measures 40mm. The resin handle has a faux ivory finish. As of today, you can pick up a Special S1 on the Internet for only $33. 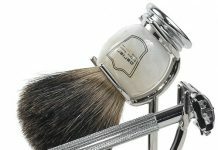 The main pro of the Special S1 Best Badger Shave Brush is its price. 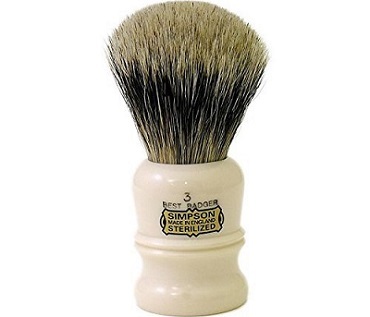 At $33, the Special S1 is one of the most affordable Simpson shaving brushes. 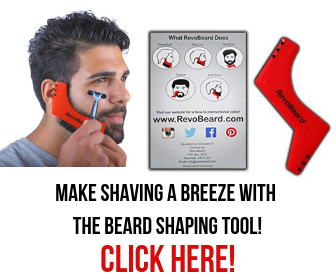 This is a great way to test out a superior Simpson product and see if it works for your lifestyle. Another great feature about this brush is its portability. Many business travelers say it’s very easy to pack this brush and take it with them on trips. A few customers have had reported that hair bristles easily drop off of the Special S1. Since this product is cheaper than other Simpson brushes, don’t expect the bristles to be as tightly packed as other designs. Also, be sure you’re well acquainted with the feel of Best Badger before you pick up this or any other Simpson product. Most people say Best Badger is in between the lightness of Super Badger and the coarseness of Pure Badger. 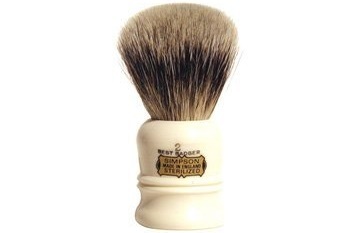 The Wee Scot Badger Shave Brush is similar to the Special S1 in many ways. Both brushes are made with Best Badger and have faux ivory resin handles. The main difference between these two brushes is that the Wee Scot Brush measures only 70mm in height. The diameter of this brush’s handle is only around ¾ of an inch wide. You can order the Wee Scot Brush for $40. Travelers tend to like the Wee Scot Brush even more than the Special S1 thanks to its smaller size. Some men have even put their Wee Scot Brush in medicine bottles! The Wee Scot is also one of the easiest brushes to use for “manscaping” in sensitive areas like the upper lip. Although it’s a bit higher priced than the Special S1, the Wee Scot Brush remains one of the cheapest Simpson shaving brushes on the market. Obviously, since the Wee Scot Brush is smaller, it holds less lather than other Simpson shaving brushes. Most men who really take the time to lather up can only get two passes out of this brush. While the Wee Scot Brush has its conveniences, it’s not ideal if you don’t travel and/or aren’t into manscaping. 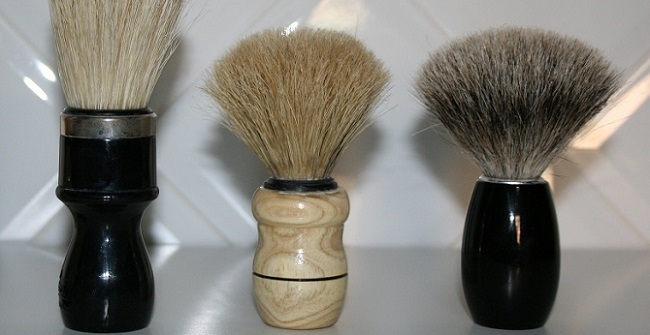 One of the main series of Simpson shaving brushes is the Duke line. Like all other Simpson series, the three brushes in the Duke set go from smallest (number 1) to largest (number 3). The Simpson Duke 2 Brush is made out of Best Badger and has a height of 90mm. The bristle loft is about 45mm, and the short handle is finished in faux ivory. 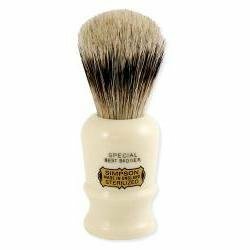 You can purchase the Duke 2 Best Badger Brush for $80. One thing customers consistently mention about the Duke 2 is its longevity. Many people who buy this product have used it without any problem for years. 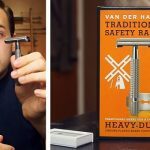 Even four years down the line, shavers can get between three to four passes of lather using the Duke 2 with a bit of warm water. Since the bristles are so tightly packed in the Duke series, you only need a dab of water to get a ton of lather. This is an excellent feature if you’re using a lather bowl and often get a watery mess from your current brush. While the Duke is superior quality to the similarly designed Special S1, it’s still a great deal more expensive at $80. If you’re looking just to try out a Best Badger brush, go with the Special S1. Only serious shavers who know they’ll be using the Duke 2 Brush for a long time should consider buying this more high-end product. 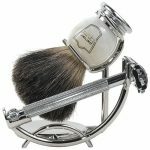 The third shaving brush in the Duke series is only about $10 more expensive than the Duke 2 and gives users five extra mm of height. The specific dimensions of the Duke 3 Best Badger Shaving Brush include a height of 95mm, a bristle loft of 43mm, and a bristle knot of 23mm in diameter. You’ll still get the faux ivory finish on the resin handle, just like all the other products listed thus far. You can easily find a Duke 3 selling on most popular e-commerce sites. Most people who review the Duke 3 praise the incredible density of the bristles. You’ll easily get four passes using this brush even with an average quality soap bar. Reviewers also note the product’s strong backbone and water retention. You’ll notice that while the bristles are rigid, they are also more flexible in this product due to the extra length. There have been a few reports online that the Duke 3 easily loses bristles. Some men claim that they had to stop using the Duke 3 after only a month of use. While these negative reviews aren’t common, you should be aware that they are out there for this product. Along with Duke, the other major series of Simpson shaving brushes is Chubby. All Chubby brushes are densely packed and contain an impressive amount of bristles. The Chubby 2 Best Badger Shave Brush is 95mm in height with a 50mm loft height and it a faux ivory resin handle. As the name of the series suggests, the handle is a bit “chubbier” than other brushes. This product now costs around $130. The tips of this Best Badger brush are incredibly soft and densely packed. You’ll have a very difficult time finding any gaps as you run your fingers through this brush. Also, the thicker handle really helps you control your shaving brush if you’ve got larger hands. Few men using this brush complain about getting lather on their Chubby 2 handle. The major con with all three Chubby brushes is the price. 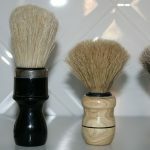 $130 is a significant investment for a shaving brush, even one that’s as well designed as the Chubby brush. While you might have a difficult time finding a brush that’s as well designed as the Chubby 2, you’ll need some extra disposable income to try it out for yourself. 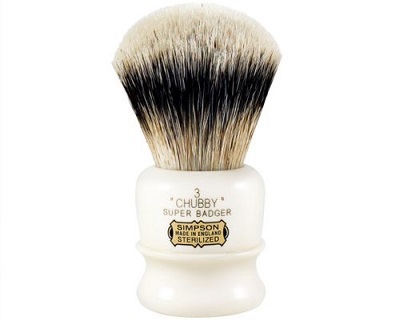 If you’re in the market for one of the most lauded (and most expensive) Simpson shaving brushes, then look no further than the Chubby 3 Super Badger Shaving Brush. People who buy this brush enjoy a 108mm height, a 56mm bristle loft, and a 31mm knot diameter. Of course, you’ll have to pay a pretty penny to experience this massive brush. 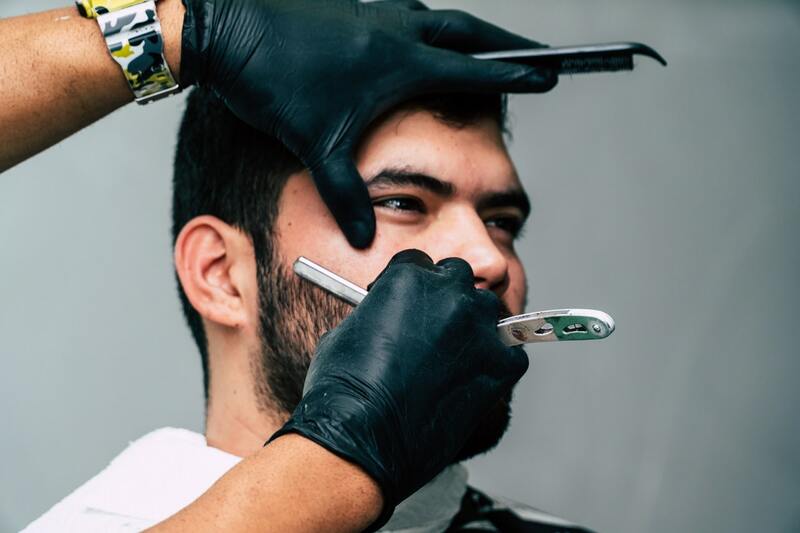 The Chubby 3 is a legendary brush in male grooming circles. This brush is actually so big that some guys can’t even fit it in their shaving mug. You’ll most likely need a shaving bowl to adequately contain the Chubby 3. Anyone with a thick beard or sensitive skin who wants a superior lathering experience can’t go wrong with the Chubby 3. The handle on this brush is even easier to control than the Chubby 2. Plus, the extra bristles make it that much easier to control how you lather your face. Again, the major con here is the price. People who get the Chubby 3 usually never buy another brush in their lifetimes. 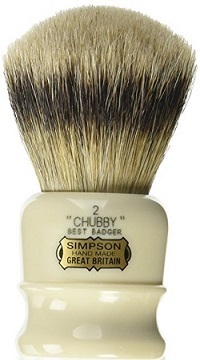 You could get an almost as good quality lather with the Chubby 2, but there’s more prestige surrounding the Chubby 3. You have to look at purchasing this brush as you would look at purchasing any name-brand luxury item. This brush is only for serious connoisseurs of shaving brushes. Whenever anyone talks about luxury shaving brushes, the conversation will inevitably lead to Simpson. Simpson remains one of the oldest and most respected brush manufacturers in the world. Over the years, the craftsmen at Simpson have perfected the luxury shaving brush and are proud to produce some of the finest brushes for the modern man. Luckily for you, there are plenty of options on the Simpson product line today to choose from. So, whether you just want to try a relatively inexpensive Special S1, or if you want to splurge on a Chubby, you’re sure to get a great lather with a Simpson product.